Toronto's breaking news, traffic, and weather. CFRB is an AM radio clear-channel station in Toronto, Ontario, Canada, broadcasting a news/talk at 1010 kHz, with a shortwave radio simulcast on CFRX at 6.07 MHz on the 49m band. 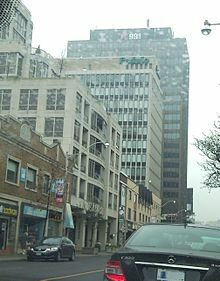 CFRB's studios are located in the Entertainment District at 250 Richmond Street West, a building which is adjacent to 299 Queen Street West, while its 4-tower transmitter array is located in the Clarkson neighbourhood of Mississauga. It is currently the third most listened-to private station in the market tied with Zommer Media's classical station CFMZ. CFRB was founded by the Rogers Vacuum Tube Company (the precursor of Rogers Communications) to promote Edward S. Rogers Sr.'s invention of a batteryless radio receiver that could be operated using alternating current and therefore did not need the cumbersome battery that had previously been required. The station itself was a demonstration of Rogers' application of his invention to radio transmitters as well as receivers, a development that allowed for a signal that reproduced voices and music more clearly. The new type of transmitter also made CFRB the world's first all-electric radio station. The letters "RB" in the station's callsign stand for "Rogers' Batteryless". The station began transmitting on an experimental basis in January 1927 as 9RB, before being converted to commercial operation a few weeks later, on February 19, with the transmission of a live symphony orchestra concert conducted by Jack Arthur. During its first years, CFRB leased time to two phantom stations: CNRX, owned by Canadian National Railways and providing programs of Canada's first radio network, and CPRY, owned by the CNR's rival, the Canadian Pacific Railway. The CNR's network was discontinued in 1933, with many of its assets eventually passing to the Canadian Broadcasting Corporation (CBC), and the CPR's radio service was discontinued in 1935. CFRB's first studios were in a mansion on Jarvis Street north of Wellesley Street, built by the family of Hart Massey. In 1929, the station moved to purpose-built studios at 37 Bloor Street West. In the same year, the station became a network affiliate of the Columbia Broadcasting System. In 1932, CFRB began airing the General Motors Hockey Broadcast, which had originated on the CNR's network. This program eventually became Hockey Night in Canada, and continued to be aired by CFRB for many years, despite also airing on the CBC's flagship station CBL. From the 1930s to the 1950s, CFRB was the radio broadcaster for the Toronto Santa Claus Parade. In 1937, CFRB began to simulcast on shortwave station CFRX at 6070 kHz. Following the sudden death of Edward S. Rogers, Sr. in 1939, Rogers Majestic Corporation Limited was sold in 1941 and became Standard Radio Limited. In turn, the company was acquired by Argus Corporation in 1946. On November 1, 1946, Wally Crouter joined CFRB. He eventually became its morning drive time host, a position he would hold until his retirement on November 1, 1996, after exactly fifty years at the station. CFRB and CJBC, owned by the CBC, made a frequency switch in 1948. CFRB moved to 1010 while CJBC took over the Class I-A clear-channel frequency at 860, previously used by CFRB. The CBC wanted its stations in major cities to be on Class I-A frequencies. But CFRB, which had been running at 20,000 watts, was boosted to 50,000 watts, giving it wide coverage over Southern Ontario. A long-lasting show, Calling All Britons featuring news, sports scores and music from Britain, began in 1965. It was hosted by Ray Sonin until his death in 1991. In 1965, CFRB moved its studios from 37 Bloor Street West to 2 St. Clair Avenue West (at Yonge Street). At around the same time, Standard Radio Limited was renamed Standard Broadcasting. The station's former downtown Toronto studios, shared with CHBM-FM (now owned by Newcap) and CKFM-FM. In 1978, Argus Corporation was acquired by Conrad Black and his brother Montegu, thus also giving them ownership of Standard Broadcasting. In November 1985, Slaight Broadcasting acquired Standard from the Blacks. In October 2007, Slaight sold Standard to Astral Media. CFRB was the number one station in the Toronto market for many decades according to the Bureau of Broadcast Measurement's ratings. However, it has declined in recent years and in 2006 was rated fifth. Ted Rogers, the communications mogul and son of CFRB's founder, had vowed to re-acquire the station that his family had lost after his father's death, and considered his failure to do so his greatest disappointment. Reports indicate that he continued to attempt to re-acquire CFRB right up until his death in December 2008. In July 2013, CFRB was acquired by Bell Media, a subsidiary of Bell Canada (the company which already owns CTV) as a result of a buyout of Astral Media. Shortly after the purchase, Bell announced that it would move the studios and offices of CFRB and sister station CKFM-FM from their long-time headquarters at St. Clair and Yonge, to 250 Richmond Street West at Richmond and Duncan (which already houses the operations of sister radio stations, CHUM and CHUM-FM) a building which is adjacent to 299 Queen Street West located at Queen and John streets (which already houses the operations of several Bell Media specialty television channels including CP24 and MuchMusic). The move took place on May 10, 2014. The transmitting antennas for CFRB are a prominent landmark along Toronto's waterfront and are visible from over 100 km away. They are used as a landmark for navigation by pilots, on approach to Toronto Pearson International Airport, or to Toronto Island Airport. The antenna array consists of 4 vertical masts, 550 feet in height. Shortwave radio station CFRX, which is affiliated with CFRB, broadcasts at a frequency of 6.07 MHz and is operated on the north end of the same site beside the main building. CFRB was one of few to broadcast in AM stereo, starting in 1984. However, since AM stereo never achieved wide acceptance, the station deactivated its stereo broadcasting system in the mid-1990s. The transmitter is located on Royal Windsor Drive, formerly King's Highway 122, 200 meters west of the intersection of Lakeshore Road West (former King's Highway 2) and Southdown Road, in the Clarkson area of Mississauga, Ontario, Canada at the coordinates 43°30′21″N 79°37′54″W﻿ / ﻿43.505748°N 79.631786°W﻿ / 43.505748; -79.631786. In early 2007, CFRB reported an increase in ratings since programming changes such as Bill Carroll's assumption of morning show duties from Ted Woloshyn. However, CFRB's morning show has trailed CBC Radio One's Metro Morning since 2003. In August 2009, CFRB announced it was laying off a number of its well-known personalities, including Michael Coren, Paul and Carol Mott, Christina Cherneskey, Jacqui Delaney and newscaster Kris McCusker as part of a move to open a "new chapter" at the station. The second phase of the shake up was announced in the fall with John Moore moving from afternoon drive to morning, replacing Bill Carroll, who moved to the 9 am to 1 pm slot. Jim Richards took over the 1pm to 4pm slot formerly held by The Motts and Michael Coren and former Ontario Progressive Conservative leader John Tory (later mayor of Toronto) took over the late afternoon slot vacated by Moore. In 2010, Carroll left CFRB to take a job in Los Angeles and was replaced by Jerry Agar. Prior to July 2010, CFRB's talk schedule was unlike most private talk radio stations in Canada, in that even in overnights and weekends, it was entirely Canadian, and had no American syndicated programming on its schedule at all. That changed when CFRB added the American-based comedy-talk show The Phil Hendrie Show for overnights. On the weekend of October 2–3, 2010, a new weekend schedule was revealed which included The Morning Show with Ben Mercer, Saturdays with Ted Woloshyn, Sports Talk with Mike Toth and Sundays with John Downs. As a result, many long running shows were cut, including Tech Talk with Marc Saltzman, Car Talk with Alan Gelman, The Dr. Joe Show, The Spider Jones Show, The Dr. Micky Lester Show and The Morning Show with John Donabie. In early 2013, the station added Astral's new late night Humble & Fred show. Josh Matlow started on Newstalk 1010 contributing to Sundays with John Downs and then began hosting his own show, "The City" (beginning in August 2011) every Sunday on Newstalk 1010 between 1-3PM. Matlow discussed city hall's top headlines with Toronto's city councillors and the week's news makers. From February 2012 until November 2013, CFRB aired The City, featuring Toronto Mayor Rob Ford and his brother and city councillor Doug Ford. The Ford brothers' version of the show was often controversial and was allegedly used by the Fords as a platform to attack their political enemies, prompting various complaints. The show was cancelled in November 2013 after Mayor Ford admitted using crack cocaine after several months of denials. The Fords were replaced in their time slot by Mark Towhey  who had previously been Mayor Ford's Chief of Staff until he was fired by Ford on May 23, 2013 at the height of Ford's crack video scandal. In 2016, Tim Hudak, the former leader of the Ontario Progressive Conservative Party, was given a show on Sundays. ^ "Rogers - Canadian Enterprises". Canadian Heritage Gallery. 1960-01-01. Retrieved 2010-02-01. ^ Paul Cassel VE3SY (2004-02-10). "Toronto Radio Station 9RB - CFRB". Hammond Museum of Radio. Retrieved 2010-02-01. ^ a b c d e f g h "Canadian Communications Foundation - Fondation Des Communications Canadiennes". Broadcasting-history.ca. Retrieved 2010-02-01. ^ "Astral Media announces signature of letter of intent to acquire Standard Radio". CNW. Retrieved July 30, 2013. ^ "CRTC approves Bell-Astral merger". CBC News. Retrieved July 30, 2013. ^ "CFRB to leave landmark St. Clair offices for Queen West". Toronto Star. July 30, 2013. Retrieved July 30, 2013. ^ "The Motts, Michael Coren out as CFRB retools - Posted Toronto". Network.nationalpost.com. Retrieved 2010-02-01. ^ Granatstein, Rob. "Say goodbye to CFRB as you know it | Comment". Toronto Sun. Retrieved 2010-02-01. ^ "Humble And Fred Return To Radio Via Astral Media, CFRB". Mediabase, January 14, 2013. ^ "Ex-Ontario PC leader Tim Hudak is finding his groove in new radio show". Retrieved 2019-04-16.